Scully's 16 week birthday was marked by the arrival of her first Paw Post box. Out of all the pet subscription boxes I looked at, I liked the sound of this one the most because they include natural, healthy treats and also try to source products from smaller companies. When you sign up, you enter your dog's age and size, and the box is tailored to that. 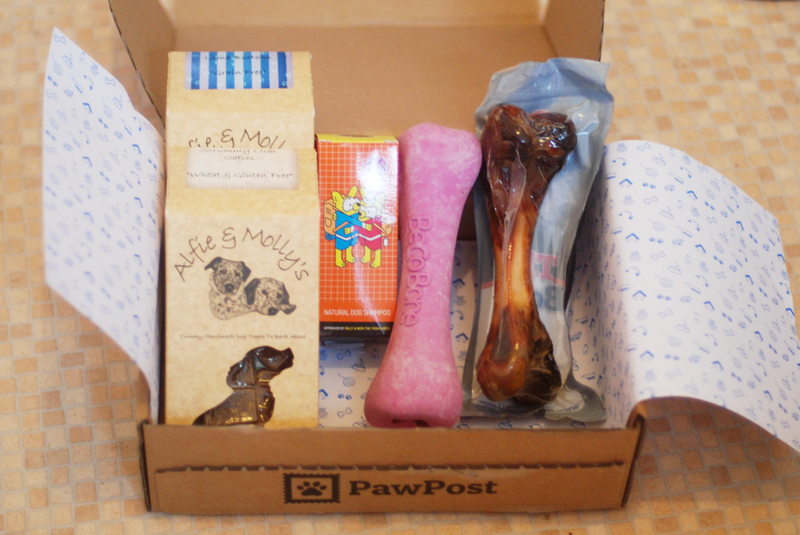 So you may see different Paw Post contents in other people's November boxes. They also do a treat only box and one for cats. 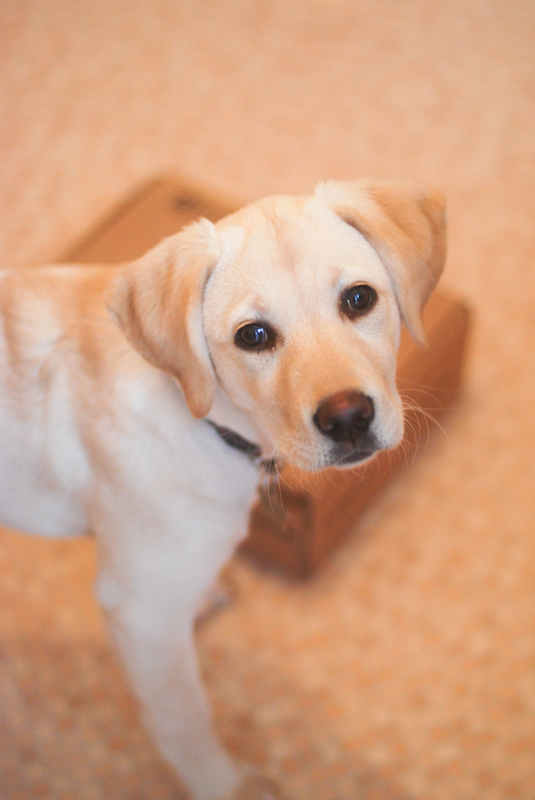 First up, Scully enjoyed chewing on the cardboard rip strip to open the box. Typical. 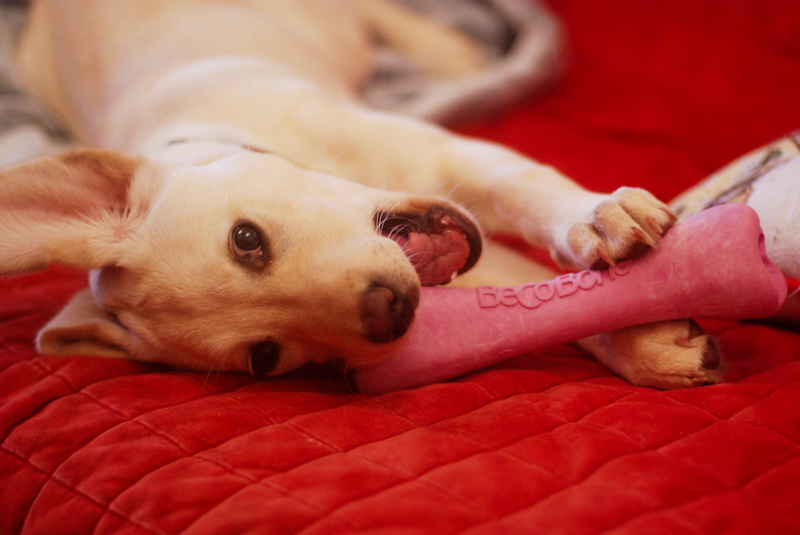 However once opened she went straight for the Beco Bone. It smells of vanilla (and rubber), is hollow on the inside for hiding treats, is pretty bouncy and is chew proof. Considering Scully is approaching teething age, more tough chewable items can only be good. Obviously, once she discovered there were treats in the box, she abandoned the toy and engaged Laser Stare. 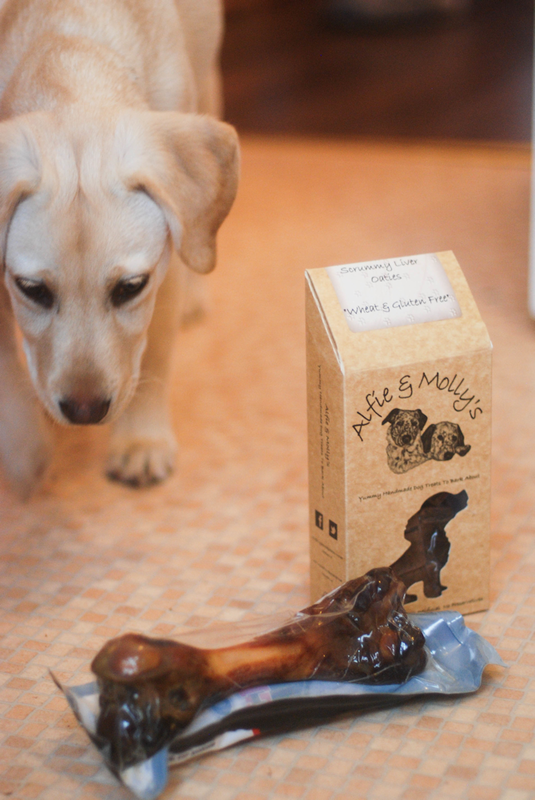 The box included two packs of Alfie & Molly's low fat treats; Scrummy Liver Oaties (gluten free) and Lamb Buttons (grain free). So far Scully has only tried the lamb ones, but they smelled good enough for humans to eat too, like lamb and mint sauce! Scully thinks they are super tasty and would like to eat the whole pack. The treats are pretty large in size, but break up reasonably easily to use them for training. I wedged one in the Beco Bone which kept Scully occupied for ages but she couldn't really get to it. I'd suggest using smaller treats if you want your dog to get to them eventually! I'm a bit cautious about giving Scully the Alpha Spirit Ham Bone just because I've heard so much about dogs injuring themselves with bones. However it does have a layer of meaty goodness on it, so we'll save it until she's a bit older and supervise her gnawing. It's actually the bone from an air-dried serrano ham. Not only is it posh food for dogs, it's also repurposing what would otherwise be a waste product. 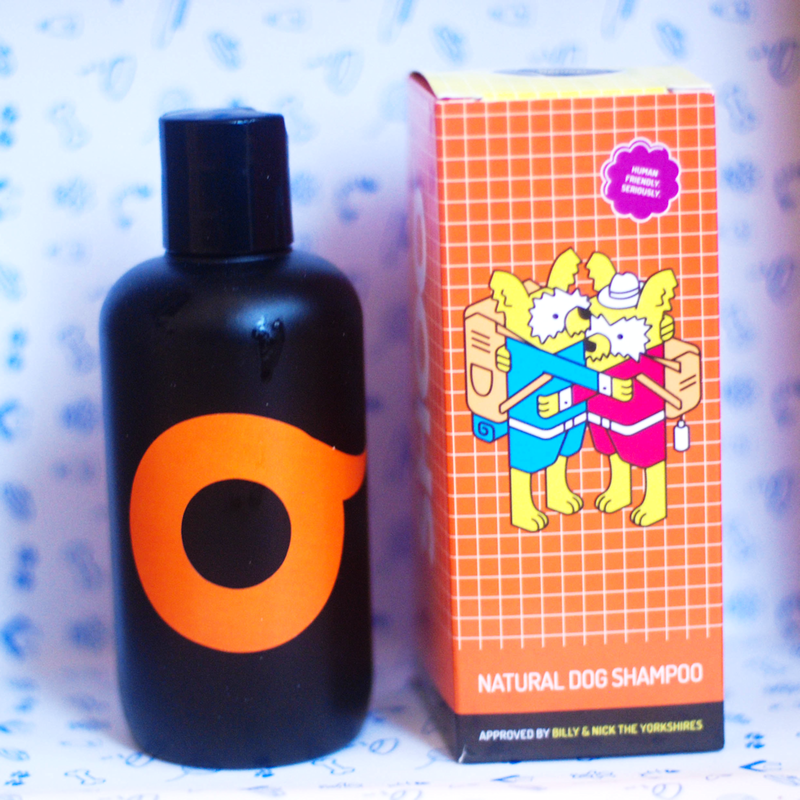 The last item is some Shoo Cedar-Wood Natural Dog Shampoo which is human friendly too. Normally we just wash Scully with water, but this will be useful to have on hand if she rolls in anything hideous! I don't think this shampoo is readily available in the UK either, so nice to have something that you couldn't just buy in the shops. The contents of the box would cost around £26 to buy separately. I signed up for a 3 month plan which works out at £20.95 per box plus postage. If you only want to try one box it's £22.95 but if you pay for 12 months in one go, it works out at £17.95 per box. So I wouldn't use it to save money but it's a nice way to try new things. We'll try to video the next one! Yes! This is brilliant. When I first saw that these were coming out I just thought what a great idea! I haven't tried to order, but I still haven't checked out if there are options for tiny dogs. 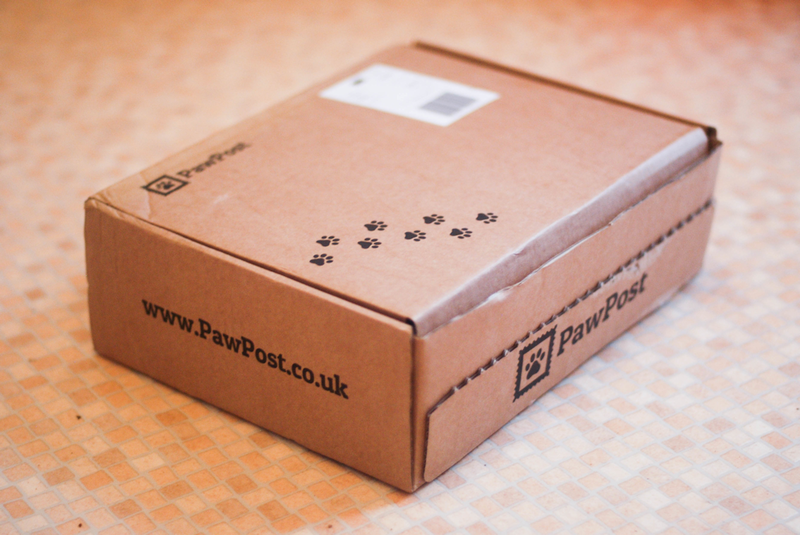 PawPost do a box for dogs under 15lbs and I've seen people ordering them for pugs and dachshunds. I think you get more items in the boxes for smaller dogs too.